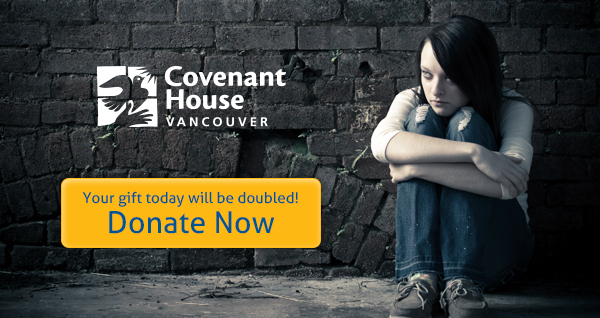 This month, every dollar you donate to Covenant House Vancouver will be doubled up to $100,000! Many of us come face to face with homelessness every day in Metro Vancouver. Homelessness can look like a young person sleeping in a doorway, other times it might be someone asking you to spare some change. Often it shows itself as a shared glance from a broken soul. Regardless of how we are reminded of the need, a common feeling often resonates: what can I do to help make this better? Here is your chance to make a difference. Some of Covenant House’s amazing supporters came forward recently to offer this matching campaign so when you donate $20, Covenant House will receive $40. Your $60 becomes $120, and so on. There’s only one non-profit organization in town that can get me to sleep outside on a frigid November night, in negative temperatures, using a piece of cardboard as a bed. That’s Covenant House. Over the last four years I have seen their work first-hand, met their clients, their success stories, their volunteers, and program coordinators. I have witnessed the positive impact they have on our city and I am so excited to continue to support them — and sleep outside again next November. Covenant House Vancouver opened its doors in September of 1997 in response to a study that revealed that there were over 10,000 (now around 8,500) runaways in BC annually. The study also revealed that street youth were in desperate need of short-term transitional shelter and long-term supportive housing. Covenant House Vancouver provides food, shelter, clothing and counselling to the estimated 700 (believed to be an undercount but no other number is deemed more reliable) street youth living in Vancouver at any given time. Most of the young people we help have fled abuse at home or have aged out of the foster care system. Last year, over 1,500 young people accessed Covenant House’s services. Follow Covenant House on Twitter and Facebook for more information, and please consider donating this month.